I am going to do a full write up of the actual meal next week (waiting on stock photos of the food because my camera did not do the plates any justice). But I thought it would be fun to show you an outfit breakdown for my Fashion Friday post. My boatneck top and waxed skinny jeans were both from Alice and Olivia – loved both pieces but they splurges for sure. I originally bought this outfit for my Fashion Forward Conference but ended up not wearing it. The C Wonder necklace is no longer available online – but it is still in stores. Just snagged it a few weeks ago. The cutout booties – sadly – I’ve owned for ages. They are from No. 704b. Here is a pair that has a similar look. 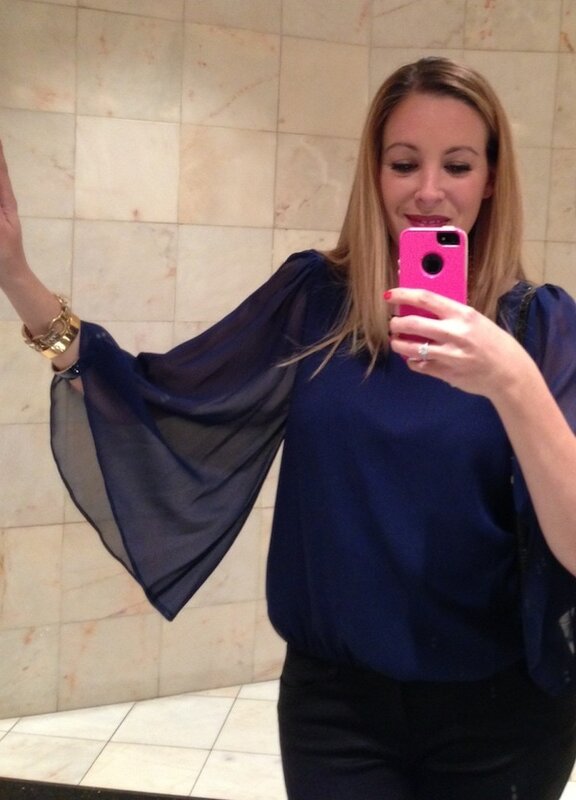 I fell in love with this blouse because of the sleeves. Something very fun and flirty about them – even though it’s a warm weather shirt. And yes, I’m in the bathroom taking a picture of it. The restaurant was SUPER dark – so I couldn’t get any shots inside!! Stay tuned for a full write up about the Polo Steakhouse at the Garden City Hotel. Love love lofe that top, it is gorgeous.